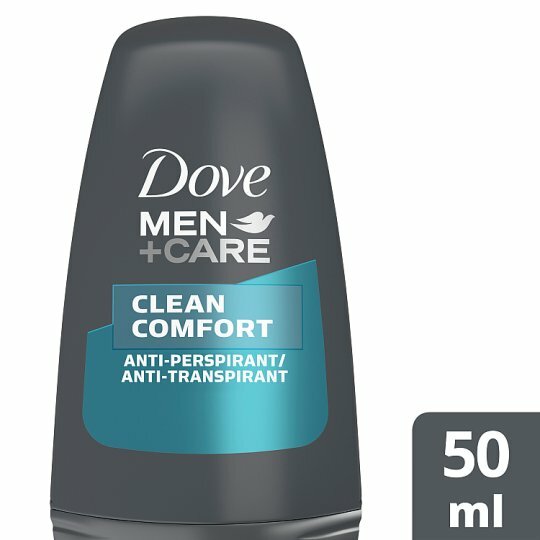 Dove Men+Care Clean Comfort Anti-perspirant Deodorant 50ml roll-on has a clean and subtle scent to keep you feeling fresh and dry for longer. Dove Men+Care Clean Comfort Anti-perspirant Deodorant protects you against sweat and body odour for 48 hours, leaving a subtle scent to keep you smelling great all day. This men’s anti-perspirant deodorant offers powerful sweat protection without irritating your skin. That is why Dove Men+Care Clean Comfort Anti-perspirant deodorant is designed to combat odour and wetness while its ¼ moisturising technology shields skin from irritation. Its non-irritant formula is tough on sweat, not on skin. Why not try it alongside our Dove Men+Care Body and Face Wash for lasting comfort and freshness? Dove Men+Care Clean Comfort Anti-Perspirant deodorant also comes in an aerosol 250/150ml, making it perfect for your gym bag, or in your luggage for when you are on the go. With our best formula ever Dove Men+Care Clean Comfort Anti-perspirant deodorant gives you strong anti-perspirant protection with a clean scent to keep you feeling refreshed and dry all day long.